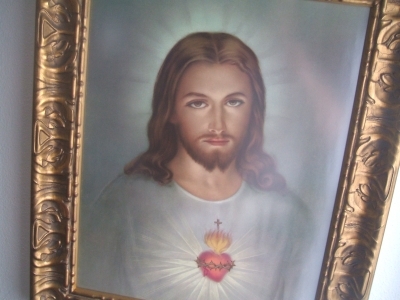 In our house, at the bottom of our main staircase, is a large picture of the Sacred Heart. It was a gift from a member of our parish who is in the regular habit of giving away such pictures (complete with the large, unwieldy frame), presumably even to strangers (since he gave us ours at our first meeting, in the middle of a crowded farmer’s market). The picture has elicited a wide range of reactions, from bemusement to mild horror to my mother’s comment that “your grandmother would be proud.” When we first got the picture I thought that I would hang it in my office; at this point, however, I think it has found its home as a religious Rorschach test for our visitors.